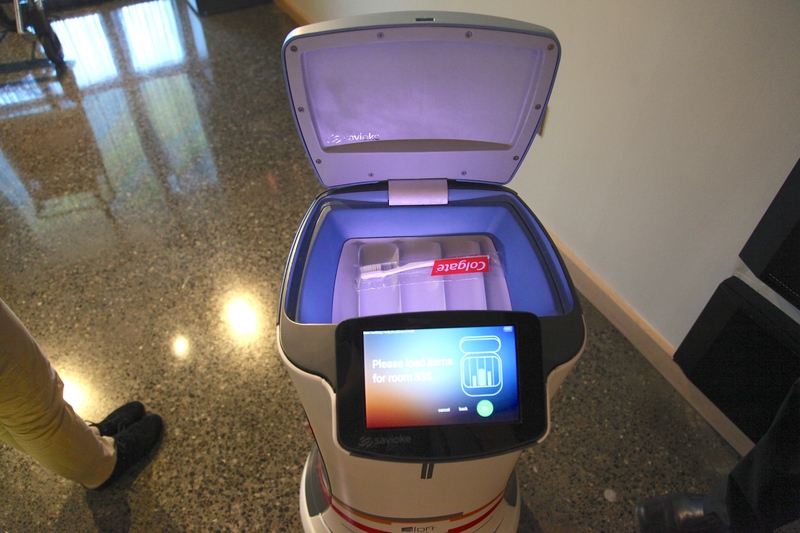 If you call down to the front desk at the Aloft hotel in Cupertino, Calif., to replace that toothbrush you forgot to bring, a human will not come to your aid. 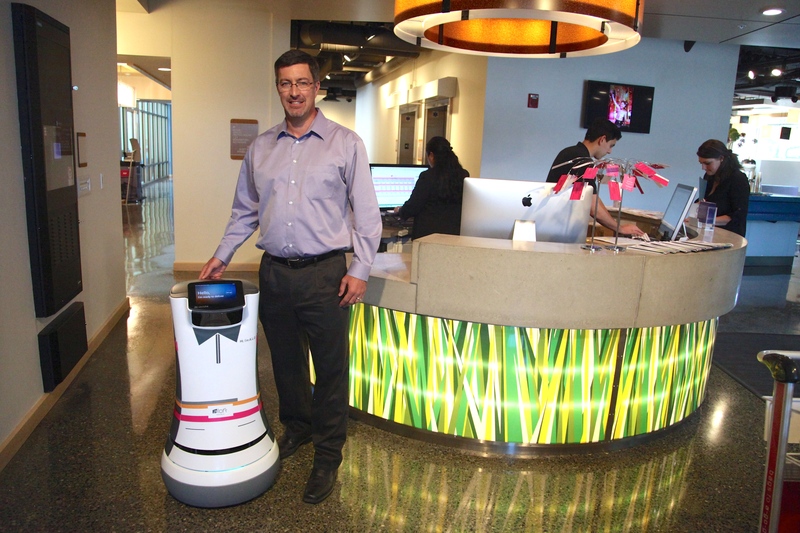 Beginning tonight, a robot named Botlr will take the elevator up to your room and deliver it instead. Savioke delivers a toothbrush to a hotel room. Photo by Signe Brewster. Botlr is the first product out of Savioke, a robotics company that received $2 million in seed funding in April to bring helpful robots to the service sector. 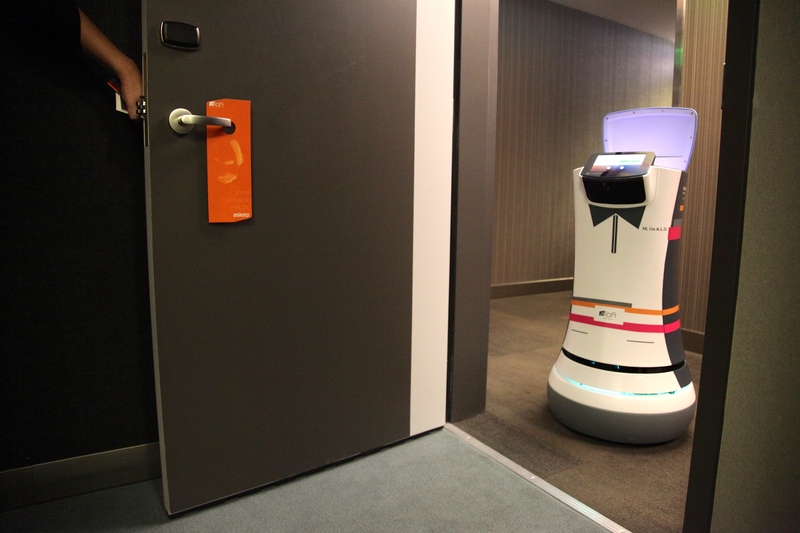 Just 10 weeks after announcing the funding, Savioke closed a deal with Starwood Hotels to begin testing a robotic bellhop at the Cupertino Aloft. Other hotel locations could follow. Botlr stands at about waist height and gets around on wheels. While waiting idly in the hotel’s lobby, it could be mistaken for an internet kiosk. But as soon as a guest calls down, the front desk employee wakes Botlr, enters in a room number on its touchscreen and drops a newspaper, mobile phone charger or any other small item requested into the small basket hidden in Botlr’s top. Botlr’s top compartment. Photo by Signe Brewster. The robot takes it from there. It rolls down the hallway from the lobby, communicates with the elevator wirelessly to know when it can board and then travels the final leg to the guest’s room. Botlr calls guests via their room phone to let them know it has arrived. The touchscreen guides the guest through retrieving their item and then asks for a rating out of five stars. If the feedback is good, it does a little dance. It sounds pretty simple, but it’s not. Botlr traverses the hotel via a pre-made map Savioke programmed in, but also relies on sensors to spot obstacles. It’s a direct descendant of the highly capable PR2 robot, which was developed by essentially-defunct robotics lab Willow Garage. Cousins, who was also the CEO of Willow Garage, told me in April that the company’s first robot would be a simplified version of PR2. And it is; Botlr is smart enough to keep a reliably safe distance from people, but relies on fewer sensors and motors. It also has no arms. All those factors mean it is much cheaper to make (though Savioke won’t say how much) than the $350,000 PR2 while retaining a lot of its intelligence. Savioke CEO Steve Cousins and Botlr. Photo by Signe Brewster.